TRIVIA of Noh : Q95 : What is “Kanjin-no”? | Home | Trivia | Q95 : What is “Kanjin-no”? “Kanjin” is a performance of Noh or Sumō wrestling to raise funds to build or maintain temples or shrines. "Kanjin-nō" was held from the Muromachi period to the late Edo era. In the middle of the 14th century, over 100 spectators were killed when multi-level seating collapsed during a performance of kanjin-nō at the riverside near Shijō Bridge in Kyōto. According to Edo period records, some kanjin-nō performances over three or four days attracted audiences of 3,000 to 7,000 per day. In the late Edo era, one such event lasted 25 days. These facts suggest that the purpose of kanjin-nō shifted from the original aim of gathering subscriptions and donations to the entertainment itself and the actors. 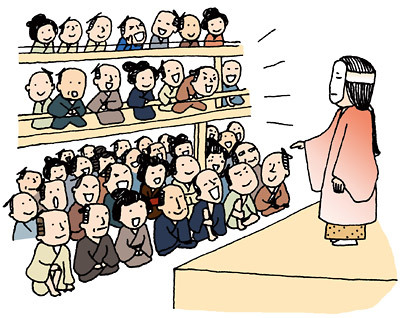 The common people were normally forbidden from watching Noh because it was a ceremonial performing art for the shōgun government. Kanjin-nō, however, had no such restrictions and the extraordinary large-scale events attracted many people. A special stage would be built for kanjin-nō and various types of fairs were held in the area. The spin-off economic benefits of the performance would have been significant.